There’s nothing i don’t love about this photograph. Last week’s Ash vs Evil Dead ended with Ash’s worst fear coming true: his beloved Delta was heisted by teenage joyriders. On this week’s “Last Call,” Ash throws a party with his longtime buddy, sleazy bartender Chet (Ted Raimi), to lure back the car thieves. Did we mention the Necronomicon’s in the car, too? Of course things will end in a waterfall of blood, guts, and assorted other viscera (if you’ve seen any episode of the show, you already know this). 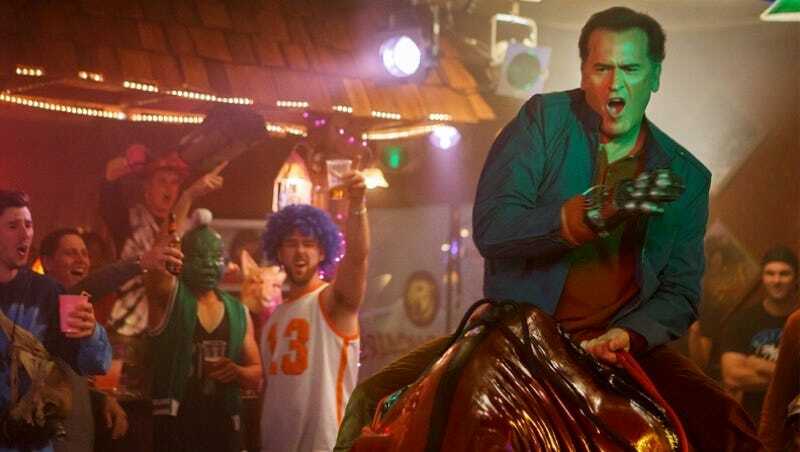 But until the carnage begins—as these exclusive sneak-peek images suggest, there ain’t no party like an Ash vs Evil Dead party. Just wait until you learn the unusual secret ingredient in Chet’s signature cocktail. Lee Majors as Ash’s father, Brock. Lucy Lawless rocks a mohawk mullet like nobody else. Ash vs Evil Dead airs Sunday nights at 8pm on Starz.